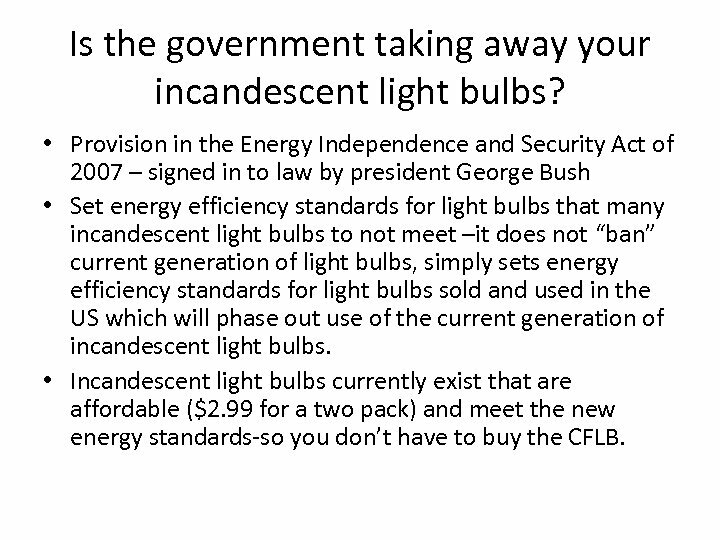 Is the government taking away your incandescent light bulbs? • Provision in the Energy Independence and Security Act of 2007 – signed in to law by president George Bush • Set energy efficiency standards for light bulbs that many incandescent light bulbs to not meet –it does not “ban” current generation of light bulbs, simply sets energy efficiency standards for light bulbs sold and used in the US which will phase out use of the current generation of incandescent light bulbs. • Incandescent light bulbs currently exist that are affordable ($2. 99 for a two pack) and meet the new energy standards-so you don’t have to buy the CFLB. LED (light emitting diodes) • Based on semi-conductor physics(more later) • First practical use was in 1962 – Early LEDs were dim and expensive ($200 per “bulb”) – Mostly used as indicator lights and in calculators • A standard 40 W incandescent bulb that lasts about 1000 hours can be replaced by a 6 W LED that lasts 50, 000 hours. – 6 W LED costs about $9. 00. 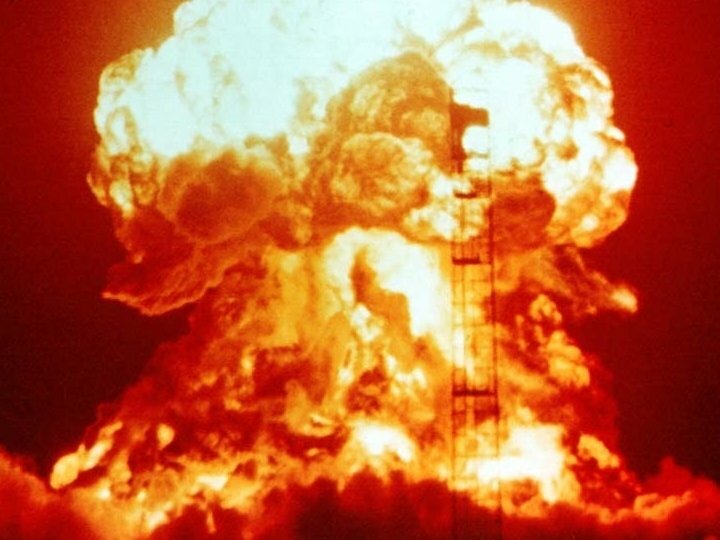 A 40 W incandescent bulb costs 1. 00. Since the LED lasts 50 times longer, the initial cost is recovered by the bulb’s lifetime. By 2015, that same LED should cost about $1. 00. 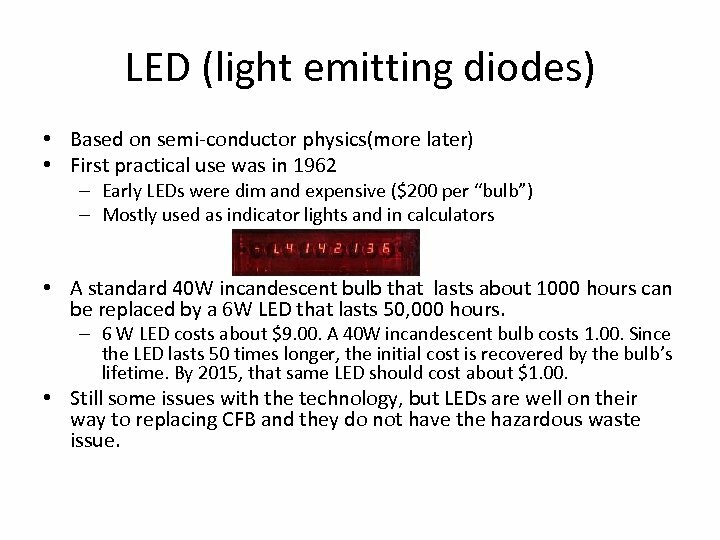 • Still some issues with the technology, but LEDs are well on their way to replacing CFB and they do not have the hazardous waste issue. 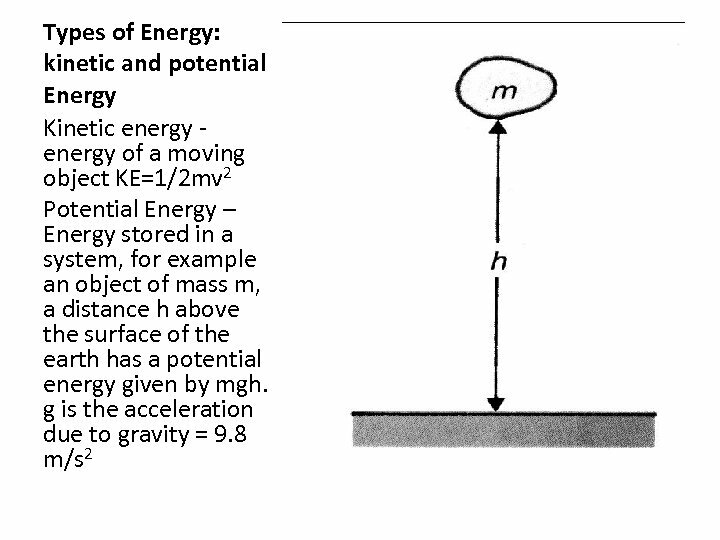 More examples of potential energy Another example is a spring, compressed a distance x from its equilibrium point has a potential energy 1/2 kx 2, where k is the spring constant, a property of the spring. 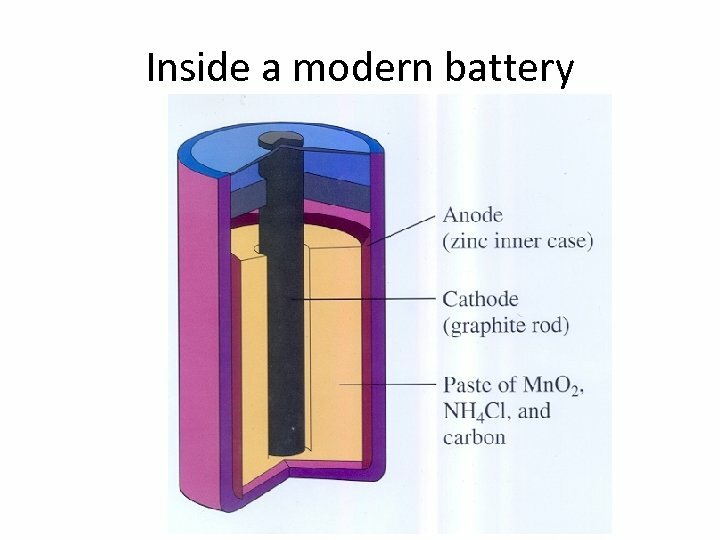 Batteries • • • 3 Parts: Cathode (positive charge), anode (negative charge) and an electrolyte (substance with free ions (atoms with a net charge) Reactions occur at the anode which release electrons, they want to flow toward the cathode. 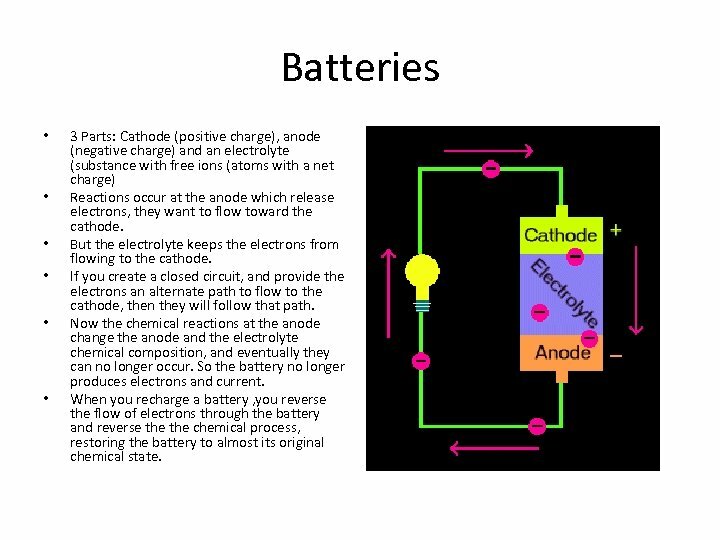 But the electrolyte keeps the electrons from flowing to the cathode. 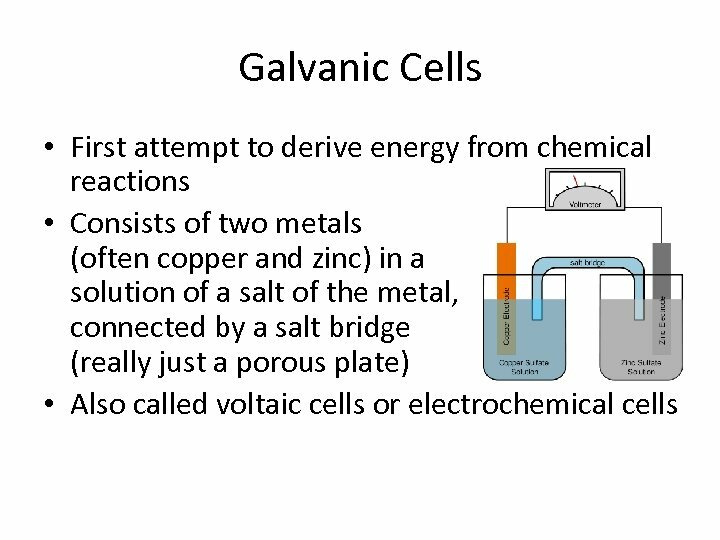 If you create a closed circuit, and provide the electrons an alternate path to flow to the cathode, then they will follow that path. 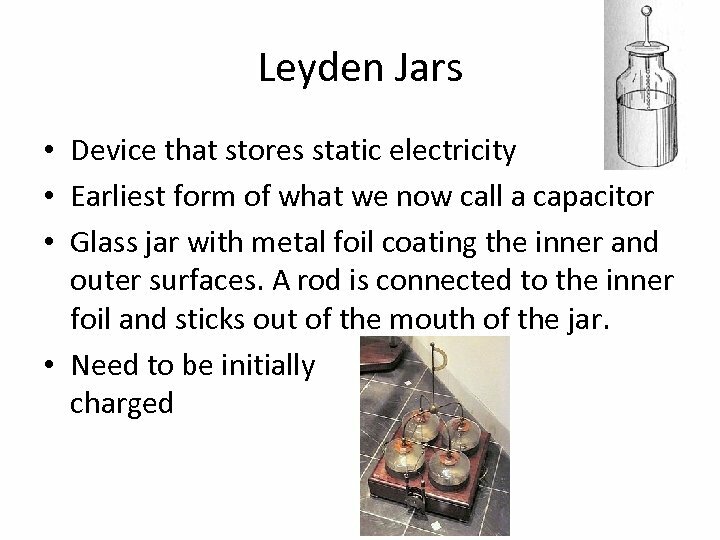 Now the chemical reactions at the anode change the anode and the electrolyte chemical composition, and eventually they can no longer occur. 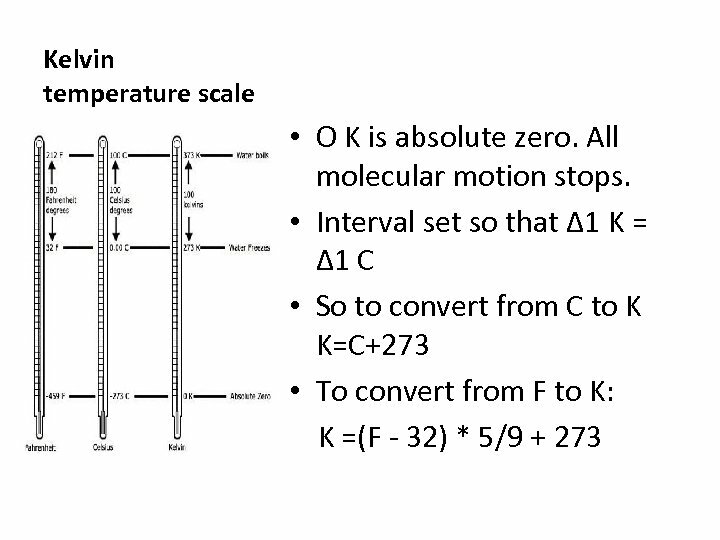 So the battery no longer produces electrons and current. When you recharge a battery , you reverse the flow of electrons through the battery and reverse the chemical process, restoring the battery to almost its original chemical state. 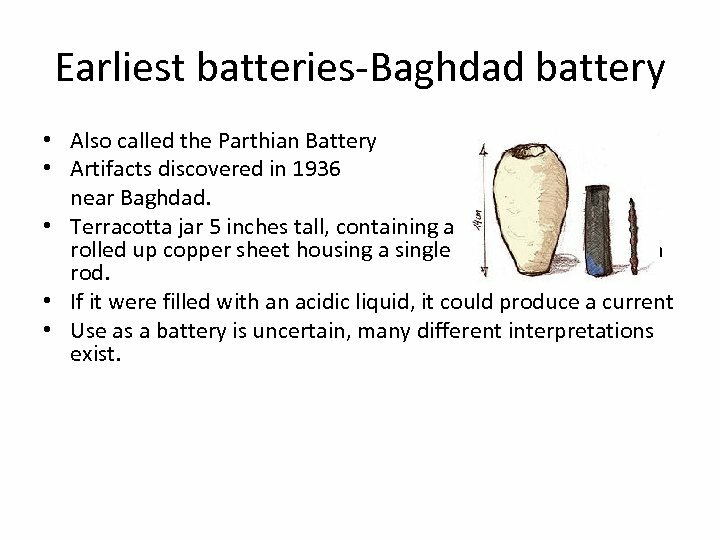 Earliest batteries-Baghdad battery • Also called the Parthian Battery • Artifacts discovered in 1936 near Baghdad. 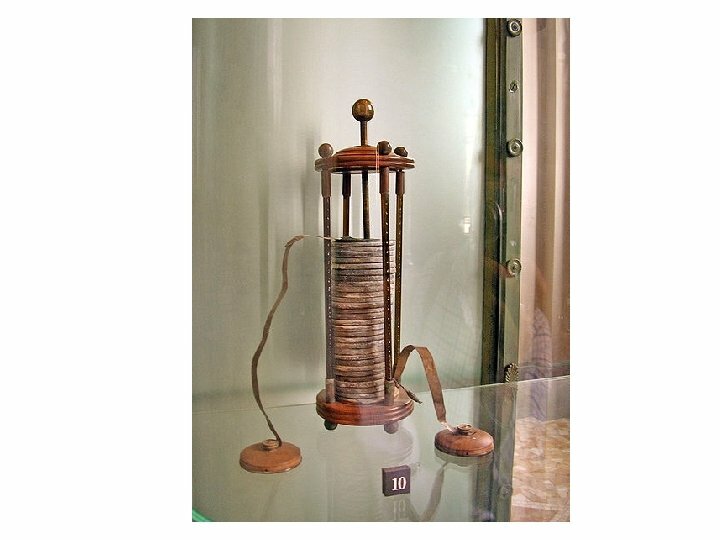 • Terracotta jar 5 inches tall, containing a copper rolled up copper sheet housing a single iron rod. • If it were filled with an acidic liquid, it could produce a current • Use as a battery is uncertain, many different interpretations exist. 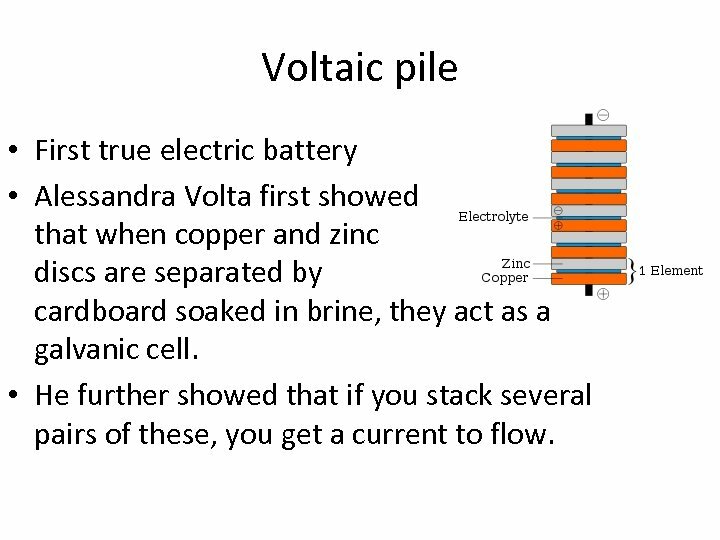 Voltaic pile • First true electric battery • Alessandra Volta first showed that when copper and zinc discs are separated by cardboard soaked in brine, they act as a galvanic cell. • He further showed that if you stack several pairs of these, you get a current to flow. 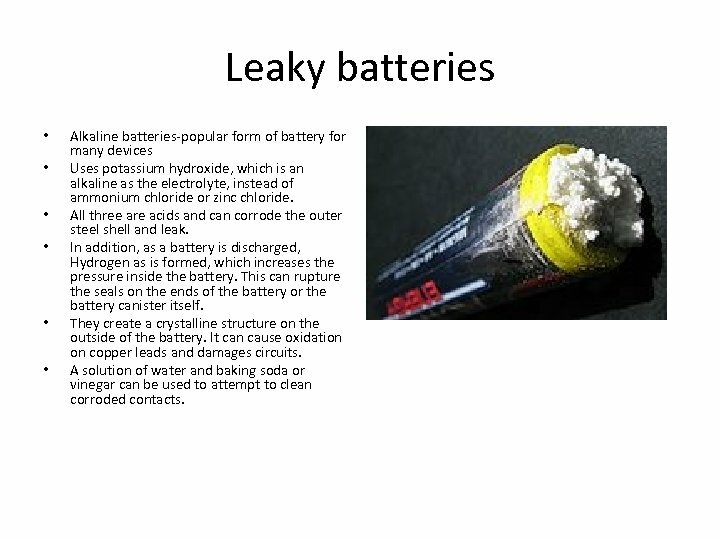 Leaky batteries • • • Alkaline batteries-popular form of battery for many devices Uses potassium hydroxide, which is an alkaline as the electrolyte, instead of ammonium chloride or zinc chloride. All three are acids and can corrode the outer steel shell and leak. 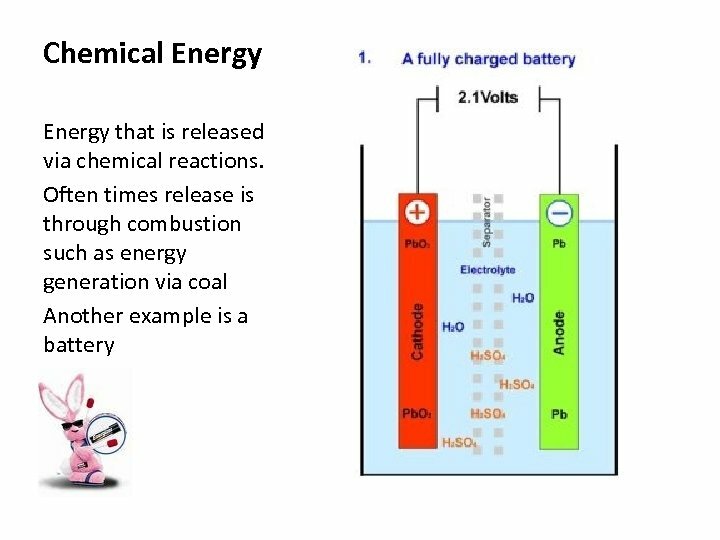 In addition, as a battery is discharged, Hydrogen as is formed, which increases the pressure inside the battery. This can rupture the seals on the ends of the battery or the battery canister itself. 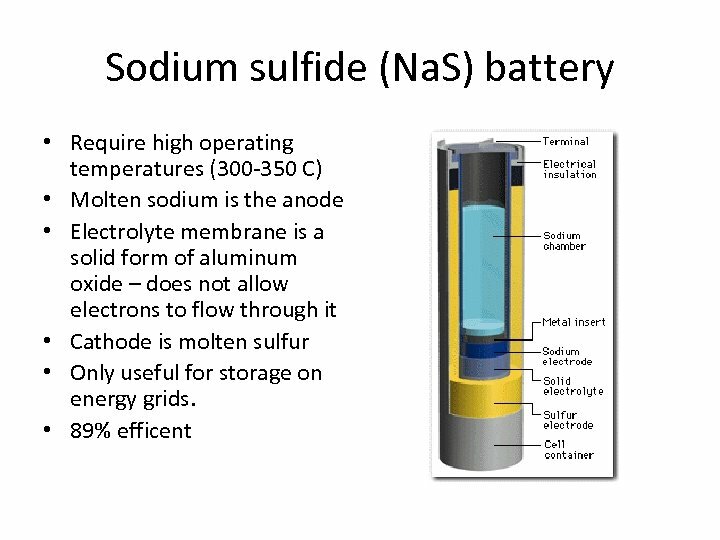 They create a crystalline structure on the outside of the battery. It can cause oxidation on copper leads and damages circuits. A solution of water and baking soda or vinegar can be used to attempt to clean corroded contacts. 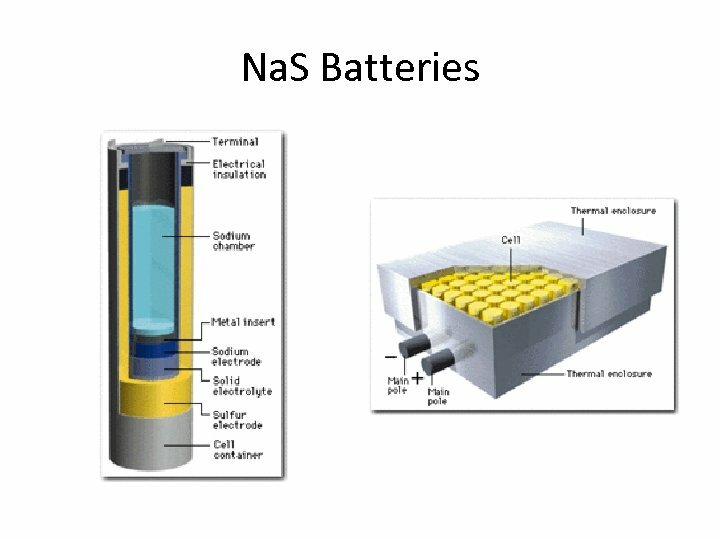 Lithium ion batteries • In these batteries, lithium ions are extracted from the anode and inserted into the cathode to create a current. 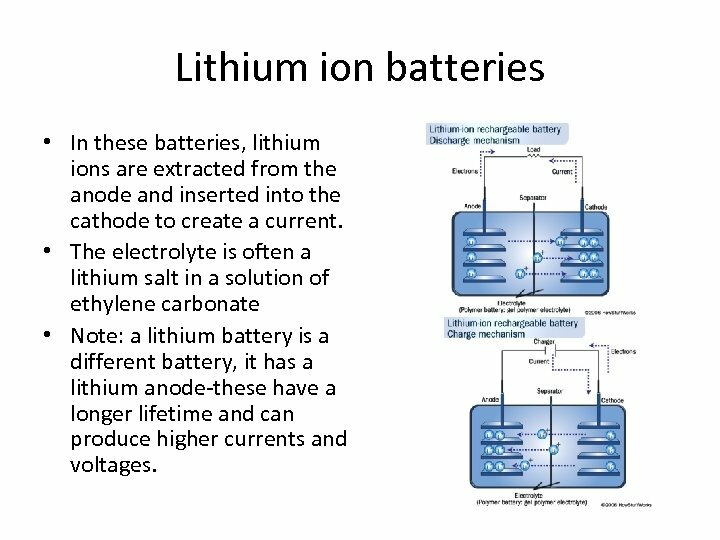 • The electrolyte is often a lithium salt in a solution of ethylene carbonate • Note: a lithium battery is a different battery, it has a lithium anode-these have a longer lifetime and can produce higher currents and voltages. 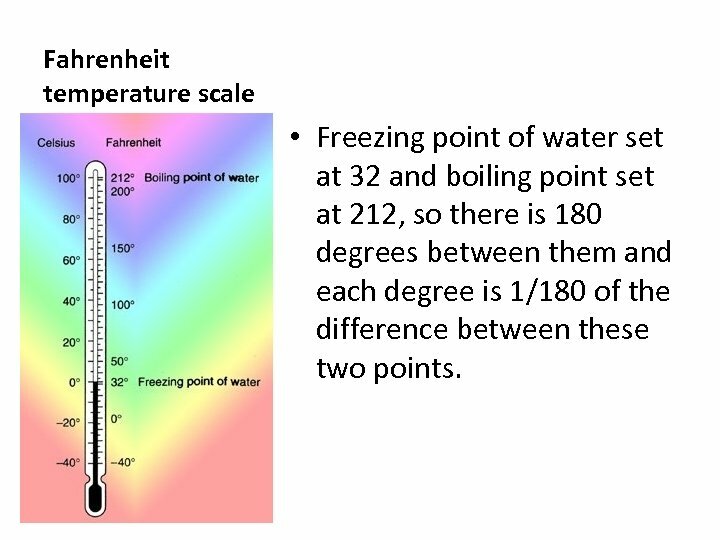 Fahrenheit temperature scale • Freezing point of water set at 32 and boiling point set at 212, so there is 180 degrees between them and each degree is 1/180 of the difference between these two points. Celsius temperature scale • Freezing point of water set at 0 and boiling point set at 100, so there is 100 degrees between them and each degree is 1/100 of the difference between these two points. 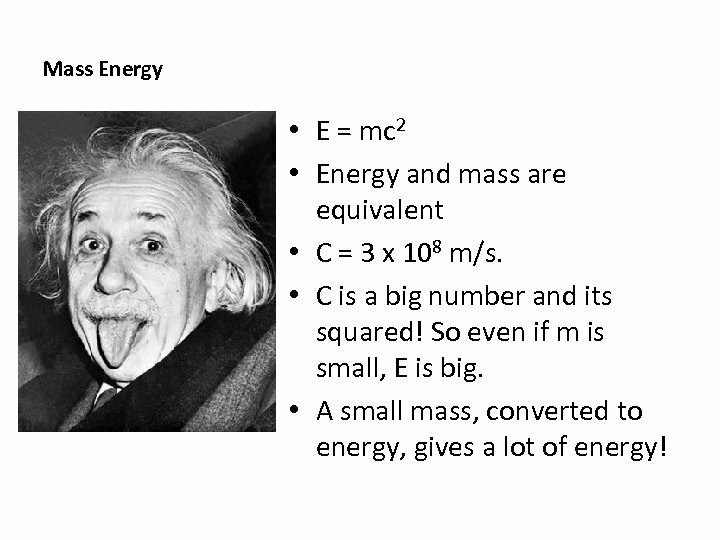 Mass Energy • E = mc 2 • Energy and mass are equivalent • C = 3 x 108 m/s. • C is a big number and its squared! So even if m is small, E is big. 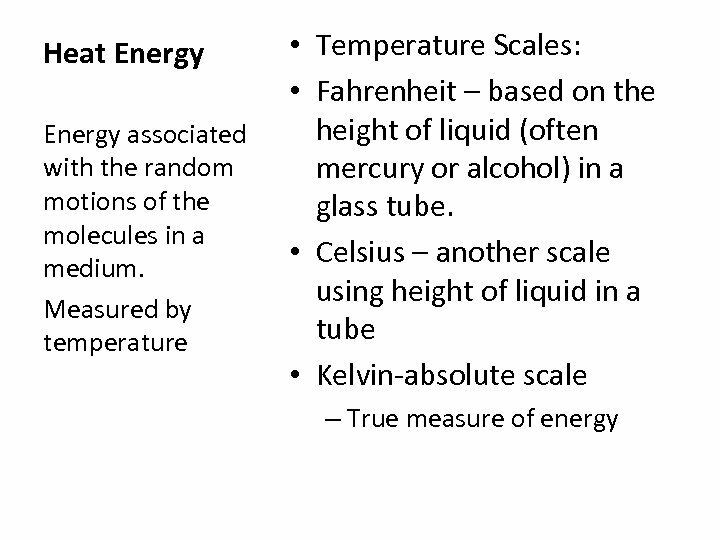 • A small mass, converted to energy, gives a lot of energy! 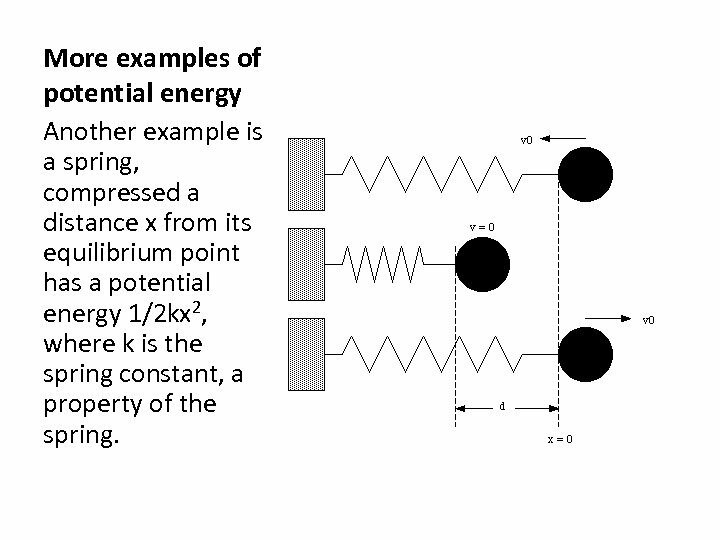 Electromagnetic energy • Light displays properties of both waves and particles. • Light is an electromagnetic wave-a wave created by alternating electric and magnetic fields. 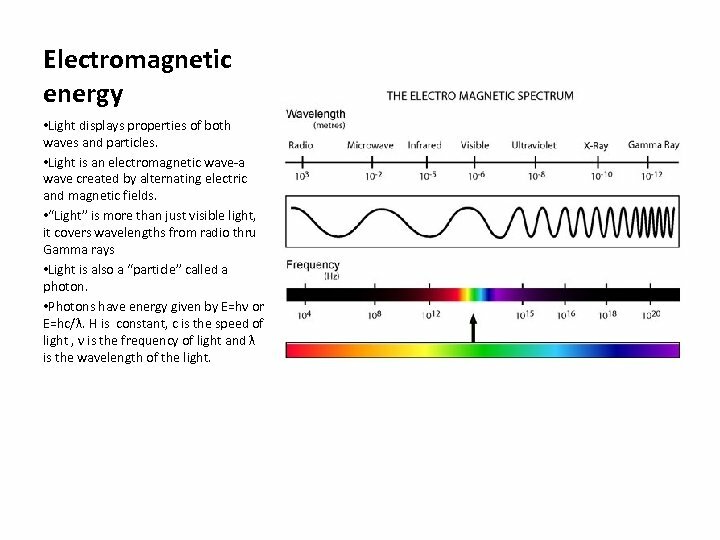 • “Light” is more than just visible light, it covers wavelengths from radio thru Gamma rays • Light is also a “particle” called a photon. • Photons have energy given by E=hν or E=hc/λ. H is constant, c is the speed of light , ν is the frequency of light and λ is the wavelength of the light.